Built in 1883 at the corner of James Avenue and King Street, on a design by the architects Barber and Barber, this two-storey brick building contained 18 jail cells adjacent to a large courtroom on the main floor, with offices for court officials on the second floor, and a full attic used as a dormitory for police officers. Renovations in 1893 were overseen by Charles Burgess. 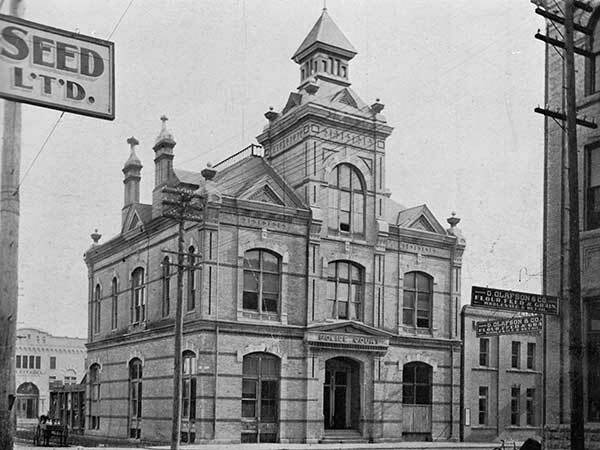 In 1908, when a new police station opened on Rupert Street, this building was renovated into municipal offices. Designated in December 1983 as a municipal historic site, it was delisted in August 1986. Source: Archives of Manitoba, Winnipeg Police Department 11, N11699. Source: An Illustrated Souvenir of Winnipeg by W. A. Martel & Sons.